Ñaupa Diablo, Musée du quai Branly, Paris. Photo by Alistair Gentry. 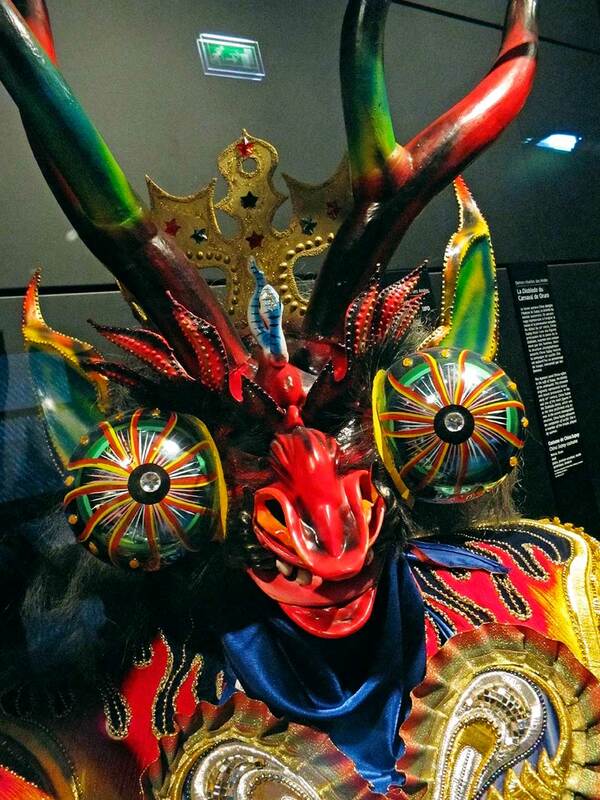 Performed during the carnival in the mining town of Oruro, the Diablada dance fuses Catholic and indigenous beliefs, depicting Lucifer escorted by a legion of male and female demons, and the Archangel Michael as the leader of the angel host. The characters in the dance are derived from the Catholic religion’s struggle between good and evil, which ends in the victory of the angels. However, in this dance, the “devil” in all his forms (Lucifer, his variant Ñaupa Diablo, his wife China Supay, and male and female devils) incarnates a positive force, linked to the Amerindian underworld divinity Supay, the giver of gifts. The devil has all the best clothes and all the best tunes. I love these costumes. Maybe not for casual daywear, though. I’m not sure how I’d integrate sequinned breastplates, huge twisted horns and this much gold braiding with the rest of my wardrobe.